In our lives we often witness oppressive situations. We witness them, but do not consider the possibility of intervening. To disrupt this pattern, we find real value in Augusto Boal’s theatre of the oppressed. To educators, he is perhaps best known for his book Theatre of the Oppressed (1973). 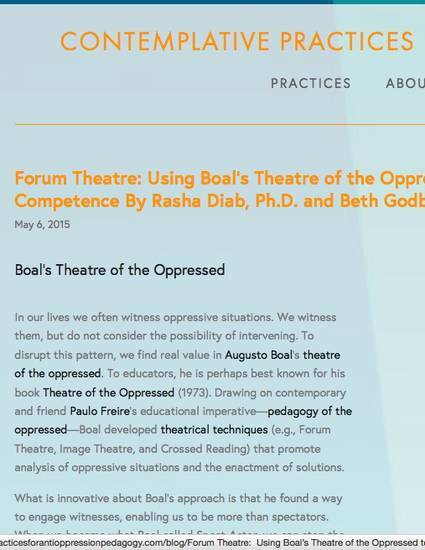 Drawing on contemporary and friend Paulo Freire’s educational imperative—pedagogy of the oppressed—Boal developed theatrical techniques (e.g., Forum Theatre, Image Theatre, and Crossed Reading) that promote analysis of oppressive situations and the enactment of solutions.